Of the world's finest cruise lines, only Seabourn can fulfill your dreams with their unique styles of intimate cruise ships. Seabourn is passionate about travel and believe that travelling for pleasure has a redemptive power that enriches people’s lives. And we believe that people should travel well. Cruising on a Seabourn ship is unlike any other form of travel. The experience is luxurious, yet relaxed — elegant, yet casual — sumptuous, yet understated. Our intimate ships visit the most desirable destinations worldwide, sailing to the heart of landmark cities, as well as to hidden gems where larger vessels cannot follow. Our ships attract interesting people, who seek to share experiences beyond the expected in places beyond the ordinary. Our acclaimed staff offers a unique style of heartfelt hospitality that is sincere, thoughtful and personal. This is the Seabourn experience — a style of cruising we pioneered when the company introduced Seabourn Pride, our first 208-guest, all-suite ship in 1988. At the time, a cruise expert stated that “Seabourn is in a class by itself,” and that is still true today. Our fleet of six graceful ships carry between 208 and 450 guests each, exclusively in ocean-view suites. They are graciously served by nearly the same number of hand-picked crew, who are consistently ranked as the finest at sea, earning Seabourn honors as the World’s Best Small Ship Cruise Line in surveys of readers by Conde Nast Traveler and Travel + Leisure. In 2009, Seabourn again raised the bar with the debut of Seabourn Odyssey, hailed as “a game-changer for the ultra-luxury segment.” Although larger than the original Seabourn sisters, Seabourn Odyssey carries just 450 guests and offers a wealth of amenities made possible by the highest ratio of space per guest in the cruise industry, including the largest spa on any luxury ship and generous private verandas on 90 percent of her suites. Seabourn Odyssey has since been joined by two identical sisters, Seabourn Sojourn in 2010 and Seabourn Quest in 2011. Our expanded fleet allows us to offer the award-winning Seabourn experience to more travelers, in more cruising regions than ever before. No matter where in our wide world you want to travel, we offer you the opportunity to see it all in perfect elegance and ease — to travel well — aboard the best small ships in the world. Intimate ships with no more than 229 suites A Seabourn ship is like a private club, where members share expansive open decks, inviting social spaces, and the personalized attention of an exceptional crew. Unique itineraries to must-see cities and hidden gems where larger ships cannot go Each cruise is a hand-picked collection of fascinating places, and each day brings a new opportunity for authentic discovery – another chance to explore your world in a personal and meaningful way. Intuitive, gracious service provided by a staff passionate about pleasing our guests It is supremely relaxing to be looked after by thoughtful hosts, whose knack for anticipating what you might like borders on the clairvoyant. Spacious, all-suite accommodations with sweeping ocean views – many with verandas Seabourn suites are thoughtfully appointed and inviting, designed as homes away from home with room to unwind or entertain. All dining venues are complimentary – dine where, when and with whom you wish From casual to elegant, indoors, al fresco or in your suite, a range of choices invites you to be spontaneous. Gourmet dining experiences that rival the finest restaurants anywhere From French fries to foie gras, every dish served on Seabourn receives the expert attention of highly skilled and imaginative chefs. The finest ingredients are selected with care, perfectly prepared to your order, and served with pride. Complimentary welcome champagne and in-suite bar stocked with your preferences Soft drinks, beer and mineral water, complete glassware and your favorite wines or spirits are ready for your enjoyment or for entertaining. Tipping is neither required nor expected – service simply to delight you Our award-winning staff is driven only by their sincere desire to please, and with a smile that comes from the heart. 56 Night Cruise sailing from Valparaiso to Ft Lauderdale aboard Seabourn Quest. 56 Night Cruise sailing from Ft Lauderdale to Valparaiso aboard Seabourn Quest. 50 Night Cruise sailing from Hong Kong to Athens onboard Seabourn Sojourn. 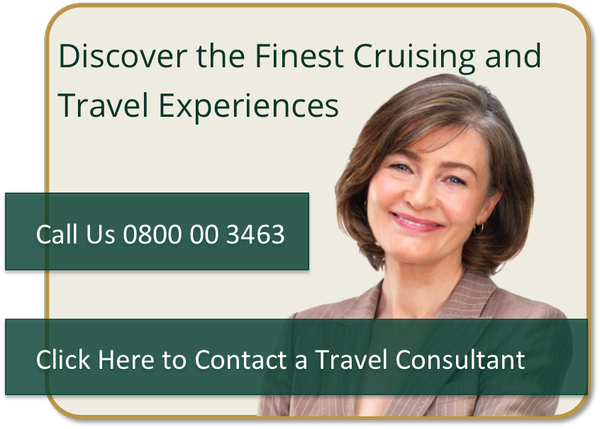 28 Night Cruise sailing from Hong Kong to Singapore onboard Seabourn Sojourn.